DIRECT PAYUnprecedented levels of transparency into media, tech and data costs. PARTNERSBroad and evolving partner roster of leading experts to drive campaign performance. OMNI-CHANNELSupporting mobile, desktop, native, DOOH and CTV to reach customers where they are. MACHINE LEARNINGDriving improved scale, efficiency and performance through machine learning. MEASUREMENTReporting tools, including in-depth multi-touch attribution analytics for online and in-store activity. AD QUALITYBrand safe, fraud-free, and viewable inventory to our clients with our comprehensive data integrations. Knowledge CenterDocuments, videos, tips and shortcuts to aid in making the biggest impact possible. CertificationDeepen platform knowledge and maximize ability to leverage features and functions. Contact UsReach out to us with any questions you may have about Adelphic’s solutions. 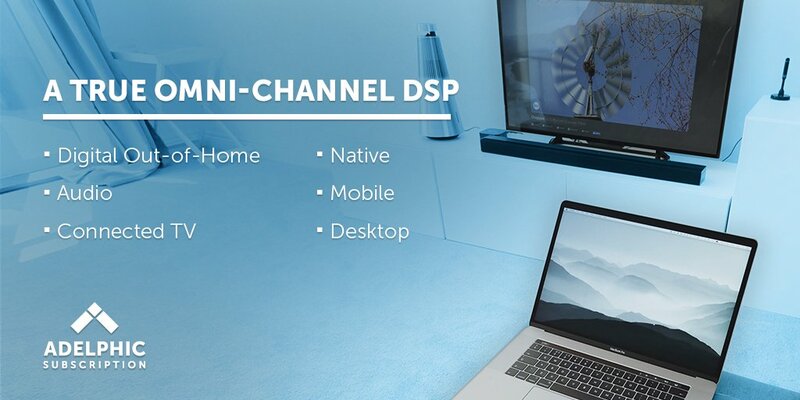 Waltham, MA, November 7, 2018 — Adelphic, Viant’s people-based, self-service platform for cross-channel programmatic advertising, today announced it will now offer a subscription-based pricing model for clients using its DSP. The new model can significantly reduce technology costs and offers an unprecedented level of transparency into media, tech and data costs. Advertisers and agencies can now license Adelphic as a software as a service (SaaS) platform with a flat subscription fee, paying a set technology cost independent of media spend. Additionally, through a direct billing structure, clients can be billed by the exchanges, SSPs and publishers directly, eliminating any intermediation and providing clearer insights into inventory costs. In a digital ad market where advertisers are calling for greater transparency, Adelphic’s new subscription model provides advertisers and agencies with more control, transparency and freedom in how their ad spend is utilized. Marketers utilizing the Adelphic low monthly DSP subscription fee will see significant cost savings that can be reinvested in working media. Advertisers and agencies currently using Adelphic’s subscription-based model are reducing their DSPs fees by as much as 80 percent, compared to percent of spend pricing models utilized today. Adelphic Subscription reduces technology costs, provides economies for scaled spending and offers clients consistency and reliability, furthering Adelphic’s goal to create a better experience and offer greater control over campaign performance for its DSP customers. This puts more of the advertisers’ budget directly into working media and reduces the “technology tax” burden. Adelphic is a leading SaaS-based cross-channel demand-side platform. Adelphic provides an enterprise-ready self-service software solution for agencies, brands and other large media buyers to make meaningful engagements with consumers across all devices, formats and channels. The company’s platform is fully RTB-enabled and delivers global scale through access to all leading inventory providers. Adelphic’s technology overcomes the limitations of user identification across all digital devices, yielding rich, nuanced portraits of real people, instead of cookies. Adelphic is owned by Viant, a subsidiary of Meredith Corporation. For more information, visit adelphic.com. Viant Technology LLC is a premier people-based advertising technology company, enabling marketers to plan, execute and measure their digital media investments through a cloud-based platform. Built on a foundation of people instead of cookies, the Viant ® Advertising Cloud provides marketers with access to over 250 million registered users in the U.S., infusing accuracy, reach and accountability into cross-device advertising. Founded in 1999, Viant owns and operates Adelphic and is a member of the Xumo joint venture. In February 2018, Meredith Corporation (NYSE: MDP) acquired Viant parent company Time Inc. (NYSE: TIME) and all its subsidiary companies, creating a cross-channel ecosystem of nearly 200 million unduplicated American consumers every month, including 85 percent of U.S. millennial women. Viant is a 2018 Inc. Magazine Best Workplaces award winner. For more information, please visit www.viantinc.com. For more information, please visit https://www.viantinc.com or contact Viant@sparkpr.com. 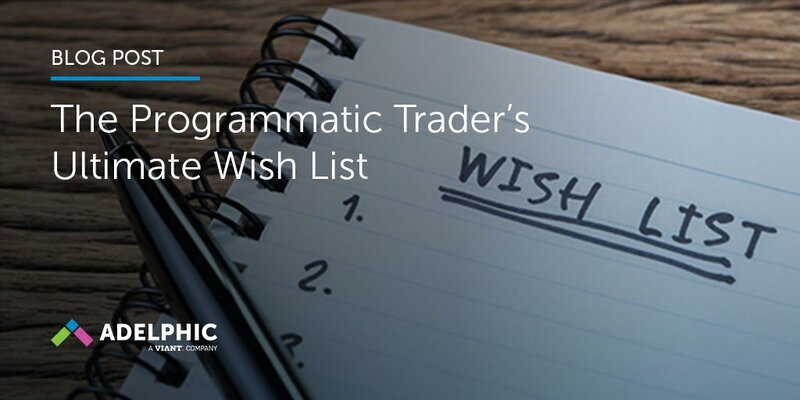 Programmatic traders play an integral role in advertising planning, strategy and execution but there are misconceptions about what they really do. Get in touch with a specialist to find out how Adelphic can help you.